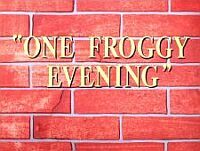 So, what do YOU think about "One Froggy Evening"? Many consider OFE to be one of the greatest cartoons ever made. Others say that sure, it's a good cartoon, but there were many other LT&MM films which were even better. Here's your chance to weigh in on the subject: how would you rate "One Froggy Evening" and why? You noticed an error - a typo, a fact is wrong, a link is dead - whatever! You have an interesting tidbit you think I should add to what is here. Or maybe you just want to tell me what you think about the site (good or bad) Thanks in advance for your valuable feedback!